A hacker compromised the main Twitter account for the Associated Press on Tuesday, creating momentary chaos across the world by inaccurately posting that US President Barack Obama was injured by an explosion in the White House. Journalists inside the White House at the time of the tweet quickly refuted the claim and reported that no blast had been felt at 1600 Pennsylvania Avenue. The AP announced from a separate account moments later that the initial tweet was not true and that hackers wrote and published the incorrect claim. 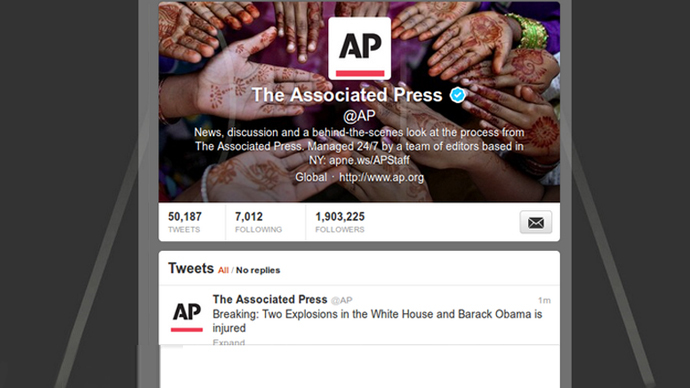 "The @AP Twitter account has been suspended after it was hacked. The tweet about an attack on the White House was false," the news agency announced. White House spokesman Jay Carney went on the air moments later to confirm that the president had not been harmed by any reported explosion. Immediately after the fake tweet went live, both the Dow Jones Industrial Average and the S&P 500 took drastic nosedives before quickly rebounding. The Syrian Electronic Army is taking credit for the compromise, but have yet to substantiate their claims. Just days earlier, though, Twitter suspended that group’s main account after they took responsibility for hacking @60Minute, @48Hours and @CBSDenver — three accounts all registered to CBS News. With Tuesday’s hack, whoever is responsible again targeted multiple accounts. The Associated Press has confirmed that, their @AP_Mobile account has been compromised as well. Mike Baker, an Olympia, Washington-based reporter for AP, says on Twitter that his company’s main account was hacked “less than an hour after some of us received an impressively disguised phishing email.” According to a report published Tuesday in the New York Times, a spokesperson for AP also confirms that malware has infected a number of the company’s computers in recent days. The Associated Press’ main Twitter account is followed by nearly 2 million social media users. The Federal Bureau of Investigation (FBI) is trying to determine how hackers were able to access the Associated Press's Twitter feed and send out the fake tweet. FBI spokeswoman Jenny Shearer confirmed an investigation, without providing further details.